1 Top 25 Filipino Verbs 2 15 Favorite Words (Chosen by Fans) 3 10 Hardest Words to Pronounce 4 10 Questions You Should Know 5 10 Phrases You Always Want to Hear 6 10 Phrases You Never Want to Hear 7 10 Phrases to Amaze Native Speakers 8 10 Foods That Will Kill You Faster 9 10 Ways to Remember Words 10 10 Filipino Foods 11 10 Reasons to Learn Filipino 12 Top 10 Compliments You Always Want to Hear 13 10 Sad Words 14 Must-Know Expressions for Agreeing and Disagreeing 15 10 Responses to "How are you?" 16 20 Travel Phrases You Should Know 17 10 Must Know Math Words 18 15 Must-Know Family Words 19 Top 10 Must-Know Vocabulary for the Restaurant 20 Top 10 Phrases You'll Need for a Date 21 Top 10 Tourist Attractions in the Philippines 22 10 Most Romantic Ideas for a Date 23 10 Ways to Save the Planet in Filipino 24 10 Things to Do in the Summer in the Philippines 25 20 Words You'll Need for the Beach 26 10 Phrases for Surviving Back to School 27 10 Must-know Autumn Vocabulary 28 10 Gift Ideas You Must Know 29 What are Your Top 10 Language Learning Goals for the Year? Hello, guys, and welcome to Filipino Top Words! For today's lesson, we will be talking about 10 Ways to Remember Words. 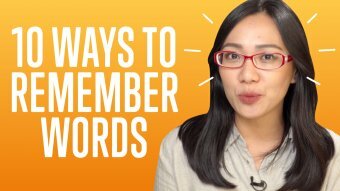 So knowing how to remember words will actually help us learn Filipino better and faster. So let's go through the first way. Mas maaalala mo ang mga salita sa pamamagitan ng pag-uulit. "You will remember the words better through repetition." Repeating stuff to yourself is actually very helpful. So even when you're reviewing for exams, that's how many people actually get to remember words. And one tip, if you're going to review or try to remember words, or things that you just want to do better remember, better study them before you go to bed. Do you know that? "to watch TV series with subtitles"
Tatlong beses sa isang araw ako nanonood ng TV series na may subtitle para matuto ng Filipino. "I watch TV series with subtitles three times a day in order to learn Filipino." For instance, because I'm still, I'm learning Japanese now, so I also watch lots of dramas or anime, Of course. And then you have subtitles there and then you hear words, you begin to associate words with the English words that you see in the subtitles, so sort of, like, you get the idea of what these words mean. And then, of course, you have to check them if they are really what you think they are. And then by hearing them again and again, and then again through repetition, you will eventually learn these words much easier. Magaling si Leny sa balarila dahil siya ay laging nagsasanay magsulat sa Filipino. "Leny is good at grammar because she always practices by writing in Filipino." I think it's very important to distinguish between spoken Filipino and written Filipino. So in our example sentence, Leny, this girl, is better in grammar because she always practices by writing. Because in written Filipino is actually actually a lot more formal than spoken Filipino. So if you want to really learn the formal Filipino then the best way for you to learn it is to practice it by writing. Basahin mo nang malakas ang mga salita. Gumawa ka ng kuwento tungkol sa iyong mga karanasan sa Filipino. "Make up stories about your experiences in Filipino." "to create associations between words"
Lumilikha ako ng ugnayan ng mga salita para hindi ko makalimutan. "I create associations of words in order not to forget them." So I think this is very useful and Filipino is... in Filipino, there are many words that sounds similar but they're actually different, that they mean differently. So for instance, you want to say "wet" in Filipino, then you would say "basa". But it's also the same four letters you would use to say "read," which meet which is basa, so says just like different way of pronouncing the words, in a way it makes it difficult. But also you can get like two ideas of those four letters together. Right? So you when you see B A S A you immediately associate it with either getting wet or reading a book, which is kind of like really far but at least you immediately get two words at once and they don't really make fun of your language. Fine because everyone speaks like kind of casual and that's your writing then of course then you don't need to worry about pronunciation but you have to worry about your grammar. Magaling ang pandinig ni Kaye dahil kaya niyang kabisaduhin ang salita kahit sa pamamagitan ng pakikinig lamang. "Kaye has good ears because she can memorize words just by listening." So some people can actually really remember words just by listening but depends on the language. So for instance, in Filipino, It's actually kind of easy to remember things by hearing but say you're learning Chinese or Japanese, right, then just by hearing you can not really easily remember the meaning of the words unless you also check the meaning of how it's written. So that in Filipino, it's kind of easier to do really understand the meaning of words just by listening and especially by understanding the context. Kapag may pagsasalin, subukan mong basahin ang mga simpleng babasahin sa Filipino kaysa sa Ingles. "If there's a translation, try to read simple texts in Filipino, rather than in English." "to listen songs with lyrics"
Maraming magagandang kantang Filipino na may lyrics na mapapakinggan sa Youtube. "There are a lot of nice songs with lyrics in Filipino that you can listen to on YouTube." Why are there so many songs with lyrics in Filipino? Because Filipinos like to do karaoke or in Filipino, videoke. Actually that's how we say it, videoke. Because we like doing it, this, karaoke, a lot so there's so many place where you can go to do karaoke. And even on days that you don't want to do karaoke, people are still doing karaoke, your neighbors are still singing, everyone is singing, it's everyone's birthday every day. So there was there's always going to be someone singing around you. "to repeat before going to sleep"
Ulitin mo bago matulog ang mga salitang natutunan mo. "Repeat the words you've learned before going to sleep." This is actually very helpful because now I'm learning how to bike. I was gifted the bike for my birthday because I was told that I need to learn a new skill. And then every evening I actually practice it. And then one of my friends said you should do, you should study something or practice something before going to bed. And then after you practice this don't do anything anymore, so don't look at your phone, don't read anything, if you want this information to be retained in your mind and in your body, if it's like an activity. So, actually, learning how to bike every evening helped me a lot. So now I can bike. So that's it for today's lesson and hope you learn something new. So what are your ways of learning words? If there is anything that we didn't say that you actually use and it is very helpful for you, don't forget to comment them down below. Hanggang sa muli. See in the next lesson. Which word or phrase do you like the most?